A relic of a bygone era – or a billion-strong social movement fighting for workers’ rights everywhere? The reality of trade unionism today falls somewhere in between. In the Western world, union-busting laws, globalization and internal conflicts have left many trade unions reeling. In some countries of the Global South, trade unionists face discrimination, danger and even death. Meanwhile, workers’ rights are being sacrificed on the altar of corporate greed gone mad: zero-contract hours, sub-contracting, privatization, outsourcing and special economic zones are all part of a ‘race to the bottom’ being run by transnationals concerned only about their profits. Yet all is not lost. From Colombia to China, Bangladesh to Barcelona, workers are still fighting for their rights – and, sometimes, winning. 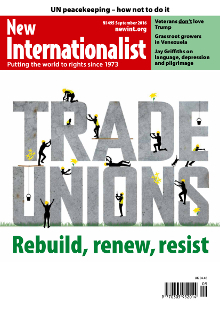 This issue, New Internationalist looks at the state of the unions, how they need to adapt to the new reality for workers in the 21st century, and why they are more important than ever. The latest view from the US, by Mark Engler. The Lovers and the Despot, directed and written by Ross Adam and Robert Cannan; The Confession, directed by Ashish Ghadiali.